At Sanctuary Memorials we are very proud of the work we do in creating unique, custom-designed memorial tombstones and gravestone. Every headstone Designs we made with the special care owed to friends and family in mourning, and to the memory of the departed. 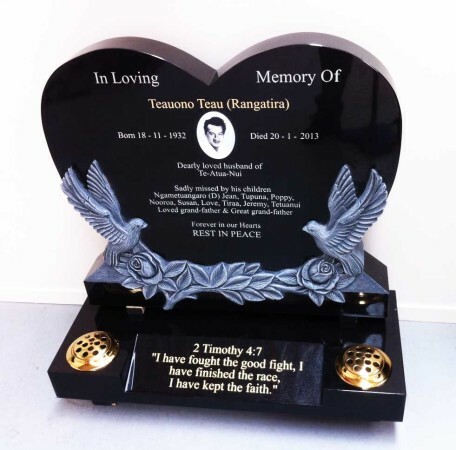 In our East Tamaki showroom you can see some of our designs to help you decide whether Sanctuary Memorials is the best choice for your headstone needs. We specialise in both granite headstones and marble headstone designs, and will work with you to create a design that honours your loved one’s memory and suits your budget. We have also created the online gallery below so that you can see examples of memorial tombstones we have made in the past. All the headstones, memorial plaques you see below were custom designed by our team. We work in close partnership with you to design special granite headstones, spending time to understand exactly what you want. We also know how to create the right product to suit your budget, offering a choice of granite or marble headstones, and doing all we can to make sure your vision of the perfect memorial can be created within your means. If you have any questions about our services or want to organise a consultation call us on 0800 600 001 or enquire online.